Legislation, systems and processes provide a rigid framework within which local government operates. In a perfect world, perfect information would result in perfect decisions. However, the world is chaotic, people are far from perfect, and priorities vie for resources, as is evidenced through the social inequality and environmental degradation in society. A common way of managing complexity is to break complex processes into manageable portions. In doing so, the advantage of integration is often lost. Furthermore, silo thinking tends to yield duplication, often through localised efficiencies at the cost of overall value. System thinking can be employed to facilitate a constructive, creative space that has potential to evolve in the presence of intuitive trust, combined with a framework with which to measure and verify against. The City of Cape Town serves as example of a local authority grappling with allocation of resources in a manner which is fair and efficient in fulfilling its electoral mandate. Most people are faced with making budgetary decisions daily - only a lucky few can perhaps afford to buy without compromise. Where money as a resource is scarce, trade-offs invariably have to be made. If the household has no money, then there are no choices to be made in allocating money. The complexity of allocating the household budget is thus initially premised on the budget existing. Once a budget is available, other factors influence complexity of decision-making, such as the structure and size of the household, standard of living, culture and value systems. Whatever the case may be, household budget choices are generally made by the head of the household, who has a fair grasp of the scope and complexity of internal budget options, expectations and priorities. The decision around budget spend is purely financially based for anyone living in poverty, but includes other factors as soon as enough money is available to provide choice - in other words, it becomes an economic choice. The aim of this research is to provide a model or models on which to base budgetary allocation decisions in the City of Cape Town, in an environment where funding constraints exist. Local government is charged with the provision of free basic services necessary for a reasonable quality of life, without which either health or the environment could suffer. This includes a vast scope of services requiring significant funding to maintain and augment, including utility services such as water and electricity, mobility infrastructure such as roads and public transport, and social and recreational facilities such as parks, sports fields and community halls. To be of value, such models would need to be simple, inclusive, transparent, flexible and capable of providing repeatable results. A comprehensive library of legislation cascades from the Constitution down to detailed National Treasury practice notes - guiding, controlling, empowering and regulating the municipal budgetary process. Applying rigorous legislation to complex systems will not necessarily result in good decisions, just as one cannot regulate for honesty or competence. Alternative solutions based on pattern and systems thinking are likely to yield better solutions, and will be explored in the context of the economic impact of budgetary allocations. South Africa is grappling with the reality of a world where resources are scarce. The term "resources" may be interpreted broadly to include everything from minerals, products, utility services, soft services, skills, and labour, to money. The economy is driven by producers selling their wares at the highest possible price, while consumers aim to purchase at the lowest possible price. When a particular resource is abundant, the price decreases. The market players thus aim to keep resources scarce as this drives capitalism (Ellis 2009: 15). Legislation tabled subsequent to the 1994 elections has provided rules, controls and processes in pursuit of equitable allocation of resources across the three spheres of government, with a focus on correcting imbalances created by apartheid. The legislation is sound and can be implemented to the letter, but yet often fails to yield the best result for reasons as simple as having a span of control that is too large to enable fair consideration of all variables and options. Given the need for infrastructure provision, South Africa can ill afford to allocate an oversubscribed budget sub-optimally. This is emphasised by National Treasury in stating in the introductory paragraph of a recent Municipal Finance Management Act (MFMA) circular that reminded municipalities to do more with existing resources (South Africa 2010). Allocation of scarce resources has and continues to confound institutions of all kinds. In the public sector, the problem of attributing value to products and services is further complicated by collective social services, such as parks, policing and security (Pauw et al 2009: 50-51). Despite comprehensive legislation, public participation and political oversight, decision-making around budgetary issues is difficult and the value hard to measure. Infrastructure is under pressure in South Africa, and resources to fund new and maintain existing infrastructure are not abundant. ■ The Arab Spring or revolution, which since December 2010 removed leaders from power in Libya, Egypt, Tunisia and Yemen, and sparked widespread protest across much of the Arab world. ■ Social imbalance and inequality. Inequality is commonly justified in that it provides incentive for individuals to work harder and thus prosper. The relative wealth adds to the incentive and drives economic growth (Galbraith 1969: 68). Redistribution of wealth has found less favour than growth has in improving the lives of the impoverished. Eradicating inequality is resisted by the wealthy on the grounds that it undermines arts and education, leads to uniformity and monotony. Galbraith also developed the "theory of social balance" which refers to the balance between private goods and public goods. He argues that public goods are artificially highly valued thanks to demand increased through advertising and emulation of conventional prosperity. So the public is prone to recognise novelty as adding value, while the less attractive social services are grudgingly paid through taxes (Galbraith 1969: 188). The South African government embarked on a strategy to create a dynamic economy (Joyce 2007: 195) in the development of a macro-economic policy titled the Growth, Employment and Redistribution (GEAR) policy. The policy was approved in June 1996 as a five-year plan to support the implementation of the Reconstruction and Development Programme (RDP). The aim of the policy was to strengthen economic development, reduce unemployment by expanding the employment base, and redistribution of opportunities and income (Padayachee & Valodia 2001: 78). GEAR relied on a market-friendly environment inspiring private sector investment to drive the social initiatives. By 2001 the economy had stabilised, but GEAR had failed to achieve its goals (Padayachee & Valodia 2001: 78). The next phase was characterised by an expansionary budget aimed at balancing broad objectives of poverty reduction and providing a safe environment, infrastructure investment and maintenance of assets, reducing the tax burden to stimulate job creation and household spending, and reducing interest rates. This was followed in 2006 by ASGISA (Acceleratd and Shared Growth Initiative for South Africa), with principles focused on achieving the millennium goals of halving unemployment and poverty by 2014. The merits of ASGISA lay in the wide consultation during its development, as well as the holistic developmental perspective (South Africa 2006). To date, the benefits have not accrued to any noticeable extent. The remarkable economic stability encountered under Trevor Manuel (Green 2008: 538) as Minister of Finance did not manage to live up to expectations in terms of job creation. The economy had grown, and could not be faulted for its stability when compared to other economies, but the formal economy had simply failed to provide the number of jobs required to alleviate poverty. Pursuing the number of imperatives requiring prominence that the new government faced, it is not surprising that job creation did not follow the stability of persistent growth (Nattrass 2008: 8). Fedderke et al (2001: 5) explored the impact of infrastructure spending on economic growth over 125 years, as it relates to rail, roads, electricity and telecommunications. The research results indicated that the economic impact was distinguishable in terms of certain types of infrastructure, but more difficult to quantify in others. The concluding supposition suggested that large-scale infrastructure investment could catapult South Africa beyond the 3% economic growth level. Bogetic and Fedderke (2005: 2-34) further confirmed that large-scale investment in infrastructure was required to remedy the underinvestment which had occurred in the past, and that the value of infrastructure in South Africa was generally comparable to that of other centres in the world. If the available funding were better applied, it could thus increase the value of the end product. It is important to consider the developmental nature of South Africa, and thus municipalities, to fully comprehend the state of infrastructure and local government capacity, as well as the necessity for the rigorous legislation and controls, all of which are aimed at protecting the people. The Integrated Development Planning (IDP) process was introduced in 2008 in an effort to provide a mechanism whereby newly formed municipalities could perform in a "coordinated, strategic, developmental and fiscally responsible way". (Van Donk et al 2008: 323) Critique of the IDP process is that it is a rigorous technocratic tool - while functionally correct, it is unlikely to provide anywhere close to an optimum outcome. Since 2010 service delivery protests have become the norm. According to Community Protests in South Africa (Karamoko 2011: 2), lack of accountability and absence of true public participation are aggravating factors in service delivery protests. While the number of monthly protests varies depending on the criteria used, protest action is widespread throughout the country, with not a month passing without a protest. Since 2007 the Western Cape has been in the top three provinces in terms of protest action. It is evident that an alternative paradigm of problem solving is required, as the programmes aimed at "fixing society" have been unimpressive. System-thinking approaches any complex system, such as an organisation, city or region, as a whole as an integrated system of which all component parts have an impact or are impacted upon by all others (Senge 2006: 7). Taking a holistic view provides space for intuition. Subconsciously the human mind is capable of integrating and dealing with great complexity. A system approach provides scope for unconventional solutions and a humanist approach to managing, empowering and providing for people. It requires a mind shift away from the conventional analysis of components towards assessing and problem-solving entire systems. In the context of using system thinking as a way of improving the function of local government holistically, it is necessary to unpack some of the theory behind system thinking as the fifth discipline. Added to the disciplines required of a learning organisation, of personal mastery, shared vision, mental models and team learning, is system thinking; the underlying worldview, in all its complexity. Personal mastery refers to "consistently realising results that matter deeply to them", anything from a physical skill to a job function. Shared vision, if achieved, inspires people to attain their best effort in all they do, not simply to comply, but with enthusiasm in sincere pursuit of the vision. Mental models are deeply entrenched views of the world, preconceptions, often providing a skewed picture of reality and stifling the opportunity to grow and learn. Team learning requires a creative space where honest conversations can lead to the necessary security and freedom of thought for a group of people to debate constructively, to think together, thereby maximising the possibilities for positive outcomes (Senge 2006: 8-10). Dealing with complexity is a recurring theme in texts offering alternative models for creating improved solutions. From complexity economics to dealing with complexity in system thinking, the propensity to divide complex organisations into manageable chunks of information has been shown to achieve fragmented results. Organisations tend to organise into hierarchical structures, which completely eliminate any organic environment. In The Origin of Wealth, Beinhocker (2006: 347) argues for an "adaptive social architecture", which will allow organisations to adapt to change intrinsically and organically rather than through policy and structural provisos. Legislation and policy in government are slow-moving and need to follow a path of public participation and lengthy approval processes, constraining government bodies, and constraining adaptability. In a complex adaptive system, it is necessary to view human behaviour, rather than rational behaviour. The premise of human resources in local government is that, while it is recognised that employees are important in fulfilling the constitutional mandate, they are not valued to the extent that they feel secure in their positions, or are recognised as individuals. The legislation informs that processes should be as mechanistic as possible, not providing for individual thought or input. In a complex system, this is thought to be unlikely to provide much in the line of value. In False Economy, Alan Beattie (Beattie 2009: 247) defines path dependence as resembling "evolutionary biology - the role played by a sequence of events, some of which may come by chance". An irresistible example quoted by Beattie is that of the configuration of a keyboard - that the layout is designed to slow down typing and specifically to prevent hitting adjacent keys in quick succession. This arose when a particular mechanical typewriter malfunctioned often due to speed of typing. The current layout has long lost the original intent, but inertia and the "network effect" or critical mass of use of a standardised layout means it is unlikely to change. The adoption of QWERTY keyboards in smart phones such as BlackBerry is an indication that the layout is here to stay. In the Black Swan, Nassim Taleb (Taleb 2007: 41) emphasises the security that man has chosen to derive from statistical analysis by adopting models such as the bell curve and linear regression to predict the future. To easily understand the concept, he posits the example of a free-range turkey that roams around the farmyard. The turkey is fed every day for a number of years, say a thousand days. Using linear regression the turkey thus anticipates being fed daily until eternity, until the day arrives that the turkey is not fed, but has its throat cut. This turns the linear regression curve upside down. Taleb's issue with the bell curve is that the outliers tend to have a far more dramatic and unpredicted effect than ever credited. The norm is used to assess risk and map the future. His ideology provides scope for alternative modelling. From an environmental economics perspective, the focus has moved from conventional through green, sustainable and restorative, to regenerative design that considers a living system in its entirety (Reed 2009: 9). The evolving system is based on patterns in nature and is seen to comprise at least the impacts of global warming, water scarcity, destruction of habitat, social justice, pollution, toxins and degradation of raw material. A model directly related to infrastructure is explained in Country-led monitoring and evaluation systems (Segone et al 2008: 56), which is predicated on establishing a strategic intent and pursuing this intent above all else. Common themes throughout these texts lie in dealing with whole systems, which are recognised in all their complexity. The importance of common vision is emphasised, as the work of man is generally performed for the benefit of man. As a local authority, the City of Cape Town is beholden to legislation, emanating from central government, which is based to some extent on events in the world. Technology enabled the world to become a global village, but it also emphasised that every country is connected, has an impact on, and is impacted on by world events. The system works because countries cooperate. So-called successful countries in particular have no incentive to be the leader in breaking out of the system. A number of models are proposed to assist local authorities, such as the City of Cape Town, in improving decision-making around budgets. It is possible that further benefits will accrue due to the variety of the models proposed. Models provide frameworks, with embedded information, which can make it easier to deal with detail, which in turn provides space for evaluating alternatives and analysing social issues in more detail. Models tend to simplify data, yielding approximations of the truth, resulting in some inaccuracy in detail. Transformation of mind-set is difficult to quantify, but transformed individuals behave in a manner that has intrinsic value. Experiencing an environment of trust, while not tangible, is nonetheless a real experience with real benefits. Over the years the City of Cape Town has used various prioritisation models, applicable mainly to capital expenditure, although they have been applied to projects funded by the operating budget. Typically, projects are scored in weighted categories including risk, compliance, IDP alignment and backlog, and a final score achieved per project. The efficacy of such models can be hampered through the crafting of creative motivations for funding - for example the strategic objectives of a local authority tend to encompass an entire spectrum of social and economic services, providing space to motivate for virtually any expenditure. Covering the business of local government in all its complexity would require a highly specialised model, which would need specialised skills to implement. In reality, any model that attempts to grade initiatives numerically will be of value, particularly if combined with interventions with the potential to enhance trust, integration and cooperation. Thus a combination of models and strategies addressing different angles of the problem has the potential of being more practical, broadly applicable and implementable than a single model. Teamwork determines that combinations of people derive better solutions in interaction than the sum of the individuals. Diversity multiplies value in any team. This happens through combining different perspectives, interpretations, heuristics and predictive models into a framework or cognitive toolbox (Miller & Page 2007: 8). Although diversity may complicate the process of agreeing rational choices, pursuit of a common goal paves the way for more integrated decisions. Apartheid planning resulted in an undeniable disparity of service delivery within the municipal area. The current administration purports to have a pro-poor focus, but this is not as evident on the ground as it may have been expected to be. A regional prioritisation model proposes to integrate geographic location with service delivery and socioeconomic measures. ■ Bulk votes across boundaries. The identification of areas in need of basic services does not necessarily require an academic exercise, and could easily be identified visually, with informal settlements displaying the largest lack of service and thus in most urgent need of intervention. Mapping is, however, required to provide structure to the cross-subsidisation that exists, to ensure an incremental improvement without the balance of areas becoming degraded in an uncontrolled manner. The regional prioritisation model above is indicative of the value that could be harnessed through the combination of geographic information and meaningful statistical data. The actual content can be adapted to the requirements of the leadership using up to date spatial and census information. 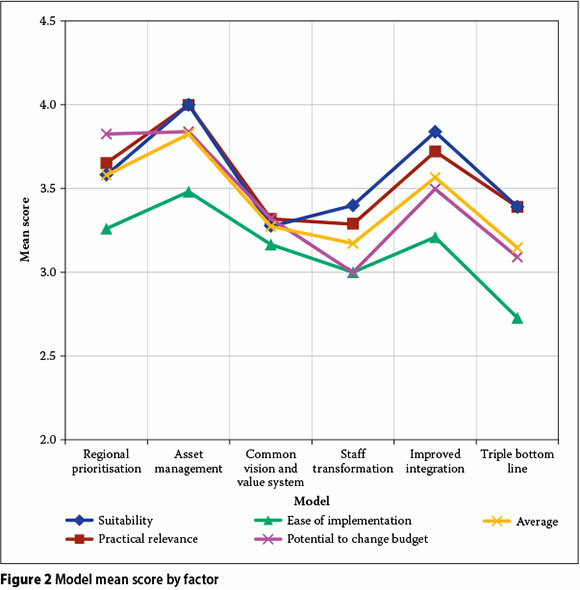 The concept behind an asset management model in providing for efficient budgeting is that information is available and accessible, informing the actual requirements to cover the cost of maintaining assets in a serviceable condition, thus avoiding indirect fruitless expenditure in allowing asset deterioration. While there is a broad understanding of the constraints provided by existing municipal service infrastructure, which restricts approvals of new development, detailed information on infrastructure items is required to determine best value investment. In complex organisations such as municipalities, the task of tracking asset life cycles is onerous, but the benefits of having a working model in place can significantly change the required funding cycles. The City of Cape Town has assets of which the variety and value are vast and way beyond the scope of this study, and the intention is not to develop a management model to suit all assets, but rather to encourage such development. Many resources are available to guide the management of municipal assets, such as the International Infrastructure Management Manual from the Institute of Municipal Engineering of Southern Africa. The asset inventory needs to be part of the SAP ERP system, having the benefit of being managed and recorded in an integrated fashion. Since the introduction of municipal integrated development plans in the MFMA, the IDP has been used to motivate budget applications. As the IDP covers virtually every conceivable reasonable activity, almost any programme can be motivated under at least one of the objectives. Beyond this stated alignment and the annual review of the document as required by legislation, the IDP document is voluminous, creating a challenge in providing a common vision or shared strategic intent. The eight strategic focus areas of the previous five-year term of office of the IDP were replaced by five pillars in the IDP applicable to the 2012-2017 period. The pillars are the expressed outcome of interaction with the people of Cape Town. The political leadership's vision for the term of office is to "create a more inclusive society by working towards greater economic freedom for all people of the city" (City of Cape Town 2012: 14). While the political leadership has a clear vision tied to the IDP, the shift from the previous IDP is perhaps not immediately apparent to the average employee. The political leadership would like to make a difference in the lives of the ordinary people of Cape Town. It is suggested that the City of Cape Town determines a clear, inspirational vision statement, crystallises a strategic intent and undertakes a programme to align the staff with this vision. A vision statement should be memorable, moving, energising. Some options are explored in Figure 1. 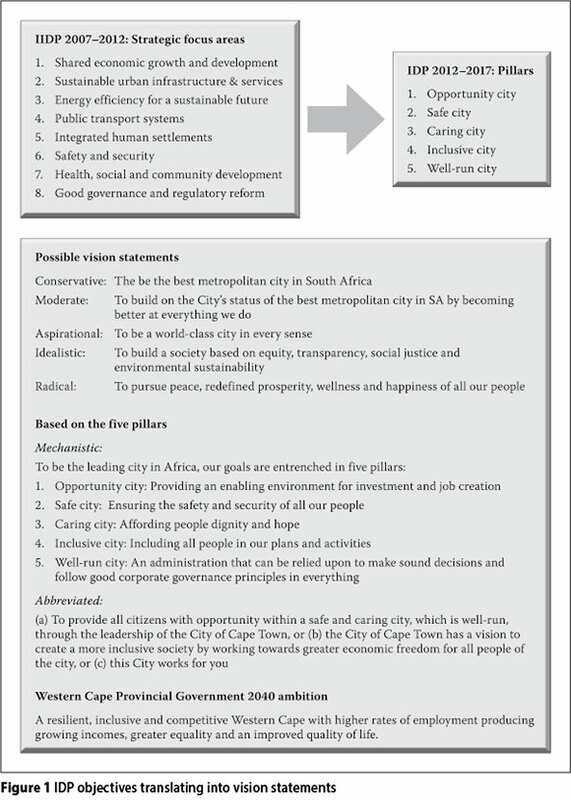 Benign visions of a local authority include conservative, moderate and mechanistic visions, as reflected in Figure 1, such as the provincial government ambition (Western Cape Provincial Government 2007: 5). At the other end of the spectrum lie radical visions, such as that of Bhutan. Bhutan has developed an alternative measure of wellbeing to GDP, which considers happiness as an important component of wellbeing (Bhutan Government 1999: 6). The risk in adopting anything other than standard capitalistic goals and measures rests in reduced competitiveness in a global world. In so far as a value system is concerned, the shortest route to a set of sound values exists in the Batho Pele principles, developed by central government in 1997 and applicable to all government departments. It may be of merit for the municipality to revive these values and ensure assimilation by the wider employee base. The values are displayed across the City of Cape Town in municipal offices (South Africa 2007). The relatively peaceful transition of South Africa into a democratic country has been captured in the annals of history. The lack of social transformation nearly twenty years later, with ever-growing deficits in housing, employment, education and healthcare, and widening gaps in social inequality is a blight on the success story. While official census data for employment and population numbers were released in 2013, the number of unemployed in the City of Cape Town still falls between 300 000 and 500 000, assuming approximately 26% unemployment. The City of Cape Town employs in the region of 27 000 people. By definition of being employed, municipal employees are fortunate, and in a position to have a positive impact on society. To have maximum impact, officials need to focus on working towards the greater good, setting narrow self-interest aside. Modern society has not been very successful in acknowledging the value of socially conscious citizenry. Broader society may thus benefit from the transformation of officials into conscious citizenry and protectors of social justice. If successful, training interventions addressing aspects such as social justice, freedom and kindness could inspire sufficient trust, integrity and commitment to ensure that decisions made at all levels by all officials have a positive impact, which will have a net benefit to the municipality. Transforming mind sets may be a difficult task, but at a relatively low cost it can have one of the most powerful positive impacts, together with a sense of satisfaction of making a lasting difference extending far wider than the workplace. If members of staff were to operate in an environment of trust, and act in the best interest of the City of Cape Town, gains could be made. Transformation intervention has the potential to cover a range of imperatives to result in a more motivated, aligned, engaged staff. Transformation is a process rather than an event; while facts illustrate concepts, value is gleaned from the experience rather than a measurable outcome such as test results. The City of Cape Town has close to four million inhabitants, with any progress in service delivery resulting in growth caused by influx from elsewhere in South Africa. The administration covers an area of 2 470 km2, through approximately 27 000 permanent staff, with a budget of close to R30 billion. The formation of the City of Cape Town was premised on a centralised model, with function-specific directorates. The scale of operations resulted in a silo approach, which provides sufficient texture to deter cross-functional interaction, unless corporately forced. Over the years, the leadership has instituted various crosscutting committees and reporting structures. Interaction combines political and administrative spheres, and occurs at high level. The current leadership introduced a cluster system as part of a transversal governance framework. What is, however, lacking is integration at a more operational level. As all staff form part of the hierarchical management structure, line management can play a valuable role in enabling the necessary integration through proper communication, covering functions, progress, policies and strategy, IDP, performance and vision, which will aid in empowering and transforming the workforce as well, and can be reinforced by electronic communication. The King Committee on Governance, in their report on governance for South Africa, emphasised the importance of leadership, integrated sustainability, corporate citizenship and social transformation. The City of Cape Town has accepted King III. Triple bottom line reporting provides the opportunity to further integrate the strategic focus areas of the IDP. By inclusion of comprehensive and holistic information in an area where, historically, finance mattered at the expense of society and the environment, the transformation to a responsible citizenry will be further embedded. For reasons of size, complexity and history, discrete projects only cover a very small portion of the total operating expenditure. If the City of Cape Town is to transform, it will be necessary to create a more flexible structure, with commitments either reduced or made more mobile. Commitments extend beyond contractual agreements on projects and include costs that have been accepted as part of the fixed establishment, such as the cost of staff, which contributes roughly a third of expenditure, the cost of accommodating the staff establishment, such as office space, transport, parking and many other support services. The cost of compliance is unavoidable, but it may be interesting to quantify this and then gauge the effectiveness against real or perceived corruption vis-a-vis other initiatives such as empowerment, to curb poor performance and unprofessional behaviour. Triple bottom line management has to extend beyond compliance and reporting, and should form an intrinsic part of all activities, providing balanced value attributed to social, environmental and financial imperatives. To conclude the development of the model, a validation survey was conducted among senior staff to gauge opinion with respect to the effectiveness of the combined model. Some of the models proposed may include interventions already implemented, and some of the data change continuously. The survey provided a summary of each of the models, and provided for each to be rated in terms of suitability, practical relevance, ease of implementation and potential to change the budget. The validation was premised on a small sample of senior officials with extensive experience in budgeting at the City of Cape Town. Individuals were targeted to participate based on their involvement and experience in budgeting both from finance and line departments, particularly Utility Services, as it is responsible for approximately two thirds of the city's budget. The sample consisted of 25 individuals in reporting levels 0-4, ranging from the municipal manager to branch heads. The results returned on the surveys indicated that all proposed models were deemed to be relevant. The difference between the top and lowest model's MS calculated as 0.68 of a point, with all scores falling between 3.15 and 3.83. Only five out of the 600 responses indicated that a model "does not" have the potential to impact on the efficacy of budget allocation, equating to less than 1%. The summary scores are indicated in Table 1 and Figure 2. The overall average of 3.43 indicates that the survey sample accepts the models proposed as valid. The comments proffered were favourable towards initiatives aimed at increasing value. A caution was, however, raised that, without political support, the best of interventions were likely to have negligible impact. Notwithstanding comprehensive legislation and commitment, the value derived from allocating budgets can be improved upon. Paying attention to softer issues, such as establishing a shared strategic intent, introducing transformational training interventions and providing a structure more amenable to integration, could enhance value, especially when coupled with technical interventions, such as asset management, regional prioritisation and triple bottom line consideration. A combination of models evolved while undertaking the research. It was recognised that, for reasons of the complexity of the municipal finance environment, no single model would have sufficient depth, offset with simplicity, to realistically contribute to better decision-making, resulting in a combination of models. The validation survey confirmed that the models could have a positive impact on optimising budget allocation. DR GISELA KAISER Pr Eng, Pr CPM, is a civil engineer with the City of Cape Town, responsible for the Utility Services directorate. The directorate provides the trading services of electricity, water and sanitation, and solid waste to the metropolitan area. She has over 20 years' experience In public and private organisations, covering a broad variety of sectors, Including consulting engineering, industrial development, retail, higher education and local government. Prior to her current role, she was the executive director responsible for operations at the Nelson Mandela Metropolitan University. PROF JOHN SMALLWOOD Pr CM, Pr CHSA, Is Head of the Construction Management Department at the Nelson Mandela Metropolitan University, and Director of the MSc Built Environment Programme. His qualifications Include a BSc In Building Management, and an MSc and PhD In Construction Management. He has published widely In journals and presented papers at conferences in Africa, Europe, South America, Asia and Australasia.